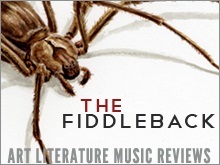 The Fiddleback is a free, independent, online arts & literature magazine that features poetry, fiction, nonfiction, interviews with artists and musicians as well as book and music reviews. Our guiding principle is cross-pollination: We believe in mixing and colliding artistic disciplines to attract a diverse readership and promote work that asserts itself. We believe in giving our contributors the spotlight, in limiting ourselves to small, quality-driven issues. Above all, we believe in never underestimating our readers.